I took a class in undergrad called Literature of Genocide. I cried, I was outraged, I had a lot of feels. After the class ended I couldn’t bring myself to read anything else about genocides, my heart couldn’t take it, I was soul weary and I didn’t want to know the atrocities that humans could commit against one another. I decided that after a couple years it was finally time to return and decided to start Rose Under Fire. 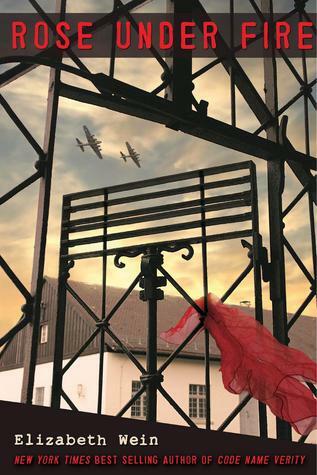 Rose Under Fire follows the story of Rose Justice a poet and ATA Pilot during World War II after she is captured by the Nazi’s and forced in to the “work camp” Ravensbrück. I haven’t read Code Name Verity so the fact that the story is told largely through journal entries came as a bit of a surprise but I enjoyed the style nonetheless. I also didn’t find that having not read Code Name Verity detracted from the story. Rose, I think, was meant to be any girl. She isn’t special, she isn’t really strong, she is just a girl that is captured by Nazi’s and put in to a situation that is unfathomable. I think that’s why I didn’t like her as much as I wanted and expected to. Rose almost immediately after coming to Ravensbrück is adopted in to a camp family who proceeds to shelter and protect her during her time at the camp. I just couldn’t figure out why they did this. I really loved the supporting characters Roza’a, Irina, Karolina, Lissette, all of these women were strong survivors. Rose to me wasn’t. I kept wishing the story had been about any of the supporting characters rather then Rose. I think, because of the Literature of Genocide class, I was subconsciously very critical of Rose Under Fire. While interesting this book did not do the things I wanted it to. I didn’t cry. There were plenty of moments designed to make you emotional but Rose Under Fire never shocked me and never made me sad, the information about the “rabbits” and experiments conducted on them was given in almost a clinical manner and wasn’t heart wrenching. I think the novel didn’t go far enough in describing the atrocities committed. Over 6 million people died in the Holocaust (that is a very conservative number). To put that in perspective Rose is from Pennsylvania to use Philadelphia as an example 6 million people live there all of them would have been killed. There wasn’t enough death in Rose Under Fire and the deaths that were given were removed. It was always someone else dying never the main characters. This did not seem true to what it was really like in Ravensbrück. I did enjoy the inclusion of the Nuremberg Trials and the formation of the International Courts to try war criminals. While it was interesting and something not often mentioned in literature it was also rather dry and felt strange in relation to the rest of the story. Because of the trials inclusion the novel ended kind of awkwardly and I was left wanting something more. Overall, this was a good story. There was nothing technically wrong and if you’re not familiar with holocaust or genocide literature it is probably an amazing and shocking read. If you have familiarity with genocide literature then you’ll probably finishing feeling like the story was a little sad and rather unrealistic. Random Aside: I actually wished the novel had ended with Rose walking in to the gas chamber having imagined all her time in France after leaving the camp. It would have been poetic, sad, and true to what actually happened at to the women Ravensbrück. An advanced reader's copy of this novel was provided by Disney-Hyperion for review purposes. Aw, sorry you didn't love it more. I loved it because Rose was ordinary and afraid, it just felt more real. I also adore poetry so that part really captured the horrors of the camps for me. Not a sunshine read then, I supposed? Important read but yeah, difficult to get through.